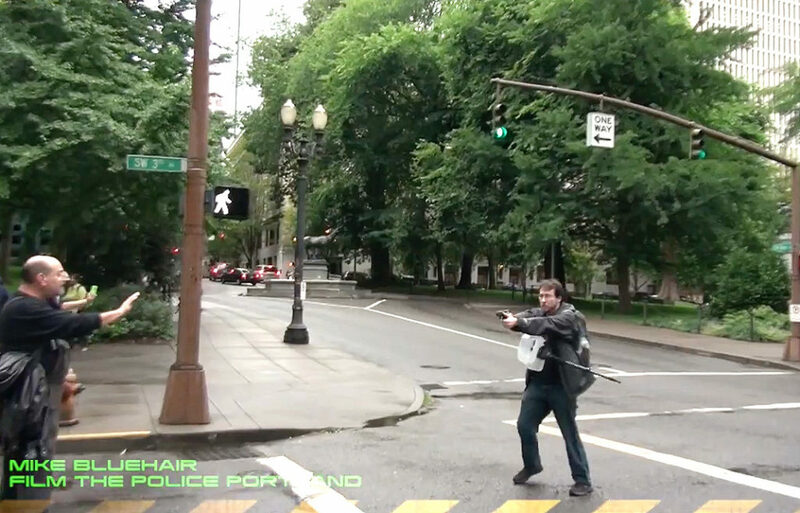 Strickland Self Defense: Will #PDX Media Change False Narrative on Gun Case? 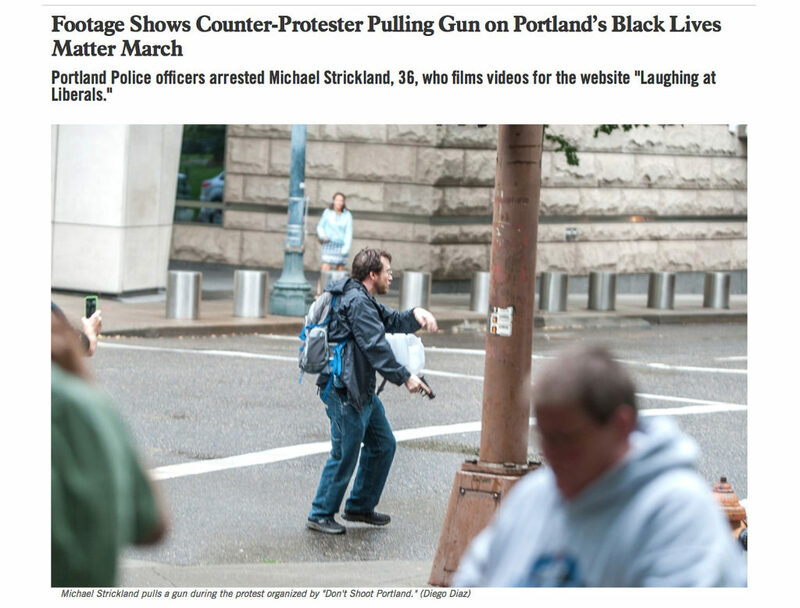 Since the Black Lives Matter protest in which citizen journalist Mike Strickland drew a pistol on protesters “bee lining” for him, the Portland media has done everything it can to depict him as something he’s not. Strickland was freed on $250,000 bail one day before a bail review hearing last week. 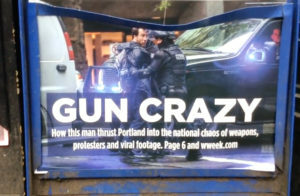 Willamette Week insists on called him a “counter protester.” The respected weekly rag has made up this characterization out of whole cloth. On what is this based, exactly? No idea. Strickland has been on the scene for years now as a citizen journalist. He will goad people into giving him a comment, but that doesn’t make him anymore a “counter protester” than George Stephanopolous is when he goads politicos with whom he disagrees to answer questions. 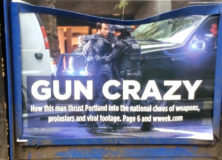 Worse, both local alternative papers, WW and “The Portland Mercury” have depicted Strickland — a legal gun owner — as some sort of nut because he drew his weapon in self defense. What, exactly, is the correct amount of ammo to carry, Oregonian? One magazine, two, six? And, as long as we’re on that, please define “extended clip” and prove Strickland had one. Where is the “extended clip”? The world awaits your answer, media. I’ll tell you what irony is. 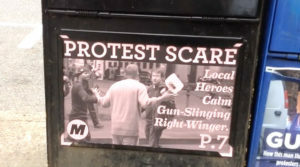 Irony is that at a supposedly ‘peaceful’ protest, protesters intentionally assaulted Strickland. Where’s that cutline in the media coverage? The media swallowed whole the story from a protester who said Strickland tried to “incite or instigate others” at the protest he was covering — when it was they who assaulted Strickland, frightening him so much that he was compelled to pull his pistol in self defense. Now, that’s irony. The media certainly have their preconceived — and wrong — narrative that they’re wedded to. The real question is, when confronted over and over with the truth of this case, will they bother to inform the public or will they stick with their false narrative? Black Lives Matter protester drops backpack and move quickly and threatening toward Mr. Strickland. Mr. Strickland, a lawful concealed carry permit holder, draws his weapon and as he continues to back away from a threat and he points it toward the threat. Once he perceives he is no longer in danger he holsters his weapon. At no time does it show that he placed his finger inside the trigger guard, indicating that he did not intend to fire. All seems perfectly logical, lawful, and proper. Where is the crime? Self-defense with a firearm is not a crime.